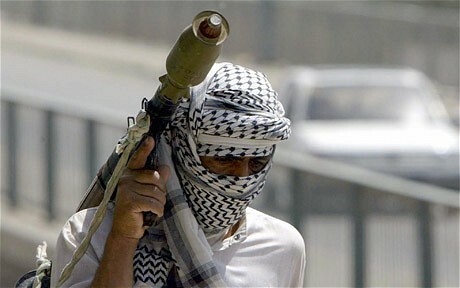 Climate of Fear: MANPADS Surface to Air missiles available for £120 aimed at Heathrow Airport from Surrey ? Is the mainstream media collaborating again in the "Climate of Fear" disinformation which the previous (increasingly hated ) Labour government deliberately allowed to fester, to bolster their repressive legislation ? The Daily Telegraph has a story, which has been plagiarised and made even more misleading by the Daily Mail, regarding the alleged threat of Shoulder Launched Surface to Air Missiles (Man Portable Air Defence Systems (MANPADS)) which could supposedly be aimed at Heathrow Airport from villages in Surrey, which are not on or even close to the flight path. They are more used to attending talks on spotting rare birds or butterflies. But the villagers of Surrey are now being given briefings on identifying altogether more sinister visitors: terrorists armed with rocket launchers. Emily Gosden may not be a specialist defence or security journalist, but this story is tagged under the "Defence" category. - why didn't the Editors spot the obvious errors ?. Officers from the Metropolitan Police's specialist aviation security team have been touring village halls with a surface-to-air rocket launcher and video footage of a missile hitting a plane in Iraq. Similar briefings have been held near other airports around the country. Police have invested tens of thousands of pounds in software to identify potential missile launch sites in recent years and have shown residents maps with red and orange dots pinpointing the most likely location for terrorist attacks. Since they are showing these maps to some of the general public, why not publish them on the Metropolitan Police website ? Or are they planning to just leave them at a local petrol station, like their colleagues did back in 2004, when such plans and more were handed in to The Sun tabloid newspaper ? The secret files handed to The Sun were drafted by security chiefs only last month to guard the airport from attack. They were found by an astounded motorist lying abandoned on a roadside just a few hundred yards from Terminal 4. The reports, compiled by Scotland Yard's SO18 anti-terrorist Aviation Security team, show detailed maps and photographs of 62 potential terror missile launch sites. James Nicholls, an Effingham resident who was invited to a briefing at Ockham village hall last month, said: "It was extraordinary, I couldn't believe it. "We were asked to look for people burying things in the ground, we were shown all the components of this heat-seeking shoulder-launched missile. They told us they had been as far as Windsor and Sunningdale surveying and looking at potential sites." Windsor and Sunnigdale are a lot closer to Heathrow Airport than Effingham or Ockham or East Horsely. Is the "Metropolitan Police's specialist aviation security team" visiting every community directly under the Heathrow flightpath in the densely populated London Boroughs of Housnlow and Richmond upon Thames ? He said officers suggested that terrorists could try to smuggle a weapon from Afghanistan, where they are readily available for about £120, and bury its components in the countryside before reassembling them to launch an attack. Surface to Air Missiles "readily available" for a measly £120 ! Utter nonsense ! Why did such an obvious mistake not get spotted by the professional journalist and the editors of the Daily Telegraph ? There have been no reports of even the Taliban or Al Qaida combatants in Afghanistan currently having access to any Surface to Air Missiles whatsover..
Back in the1980's when Osama bin Laden used to work with the CIA against the Soviet invaders of Afghanistan, the US Government did supply Stinger heat seeking shoulder fired SAMs to the "freedom fighters" in Afghanistan which were used against Russian helicopter gunships etc. Why would any terrorists with access to such a weapon bother to bury it in the ground ? Why would it not be undetectably stored in whatever vehicle or shipping container used to smuggle it in to the country in the first place ? Why would missiles be smuggled from Afghanistan, rather than directly from Russia or Eastern Europe ? 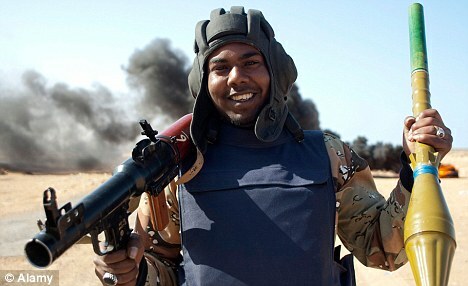 The only people who might be able to do this from Afghanistan, would be corrupt British or US military personnel. Is that what the Metropolitan Police's specialist aviation security team are implying ? The black market value of such a missile is probably in six figures, but all the recent plots to buy such missiles seem to be (illegal in the UK) entrapment sting operations e.g. 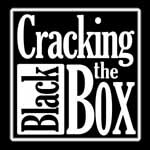 See Spy Blog: Where did Hemant Lakhani get an Igla missile from ? 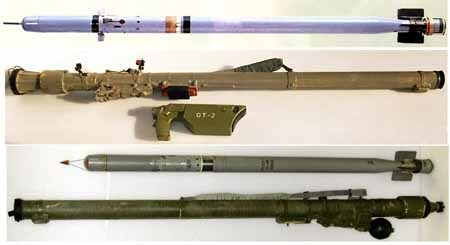 Note how much longer the rocket obviously has to be for a MANPADS anti-aircraft missile, compared with the much shorter range Rocket Propelled Grenade anti-tank weapons. During their briefing, officers showed residents footage of a DHL Airbus A300 cargo plane as it was hit over Iraq in 2003. The missile struck a wing and caused the complete loss of hydraulic power, forcing the pilot to make an emergency landing. Mr Nicholls added: "To watch this shoulder-launched weapon hit this aeroplane at 8,000ft and take half the wing off it - everybody in that room was stunned. "They told us, there's no threat whatsoever, but please be on the lookout. This is an awful lot of work to be putting in if there is no threat." Rather less than taking "half the wing off it ", which is presumably why the pilots were actually able to land ok. The maximum range of such a missile is stated as 4200 metres - the horizontal range to an aircraft on a landing or take off flight path will obviously be much less. The villages of Effingham, Ockham and East Horsley are about 15 kilometres South of Heathrow airport (where the landing and take off flight paths run East - West). 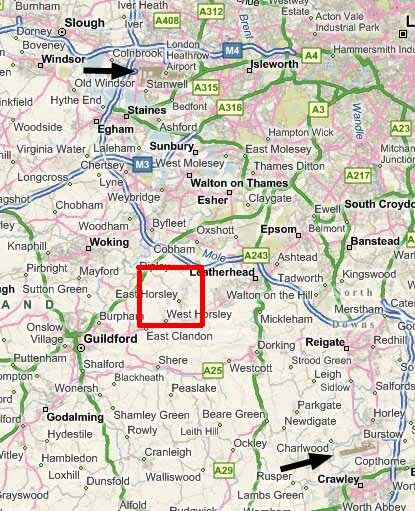 They are about the same distance North West of Gatwick airport, where again, the runway is aligned nearly East - West. Even if MANPADS were somehow available to terrorists in the UK, they would be out of range from there. i.e. definitely not an illustration of a MANPADS anti-aircraft missile. Terrorists could never hit an airliner on a landing or takeoff, at Heathrow Airport from these villages over 15 kilomteres away in Surrey, neither with an RPG7, nor even with a much more expensive and sophisticated MANPADS. A Metropolitan Police spokesman said: "The MPS regularly holds community engagement events to build relations with the community and to encourage the public to be vigilant, and to report any suspicious activity to police. This is part of an ongoing process and is not in response to any specific intelligence." Why did the Metropolitan Police Service press office not correct the factual errors in both the village hall briefings and in the mainstream media reports ? Lying to the public and stoking up a "Climate of Fear" via the mainstream and tabloid media is a propaganda victory for our terrorist and other enemies.